During the trip Skialp & freeride with Naboso in Macedonia, March 1–10, 2013, I was testing excellent set that consists of skis Dynafit Huascaran (length 186 cm, 135–114–124 mm) with new freeride DIN 16 binding Dynafit BEAST and shoes Dynafit Mercury. Results of practical usage of Dynafit BEAST are here. I had participated at Dynafit Press Event that was hold at the hut Rifugio Fanes (2060 m) in the Dolomites in the middle of January 2013. 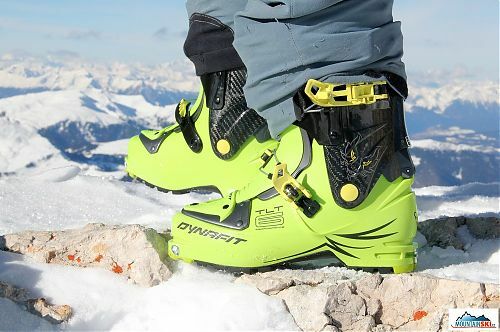 There was a great opportunity to do ski-touring trips in the prototype of new shoes Dynafit TLT6 Performance CR in January 10–13. Except of these shoes I had used skis Dynafit Nanga Parbat and Dynafit Cho Oyu. 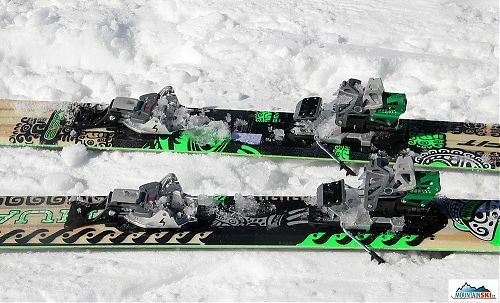 As a long time user of binding Dynafit TLT (since 2000) I was interested in possibility to test the first fully functional binding (out of the superlight competition models) on the market after the patend of Dynafitu was over. Binding G3 Onyx was firstly introduced in March 2009 and after optimalization of some details it became an alternative of Dynafit, especially for freeride. Here, personal experience with G3 Onyx during Ski-touring course for the members of club Hedvábná stezka was excellent in RaxAlpe are presented. Sport shop RUMASPORT from Ostravice had prepared testing of new models of ELAN skis in the ski resort Ski Park Gruň on Sunday, January 20, 2013. There were several tens of poeple interested in testing of new skis ELAN. There was taken place an interesting Dynafit Beast Event in the Italian Dolomites in January 10–13, 2013, and this event brought us an introduction of the new trendy freeride Dynafit BEAST bindings with breaking strength of DIN 16. So far, only a brief introduction, practical test is going to be available for us in coming days. Immediataly after returning from trip Slovinsko – Julské Alpy v zimě organized by CK Alpina I have spent only several hour in Czech Republic. I have left at ISPO 2010 to Munchen on Monday morning at 4a.m., Feb 8. I could stay only for several hours there, so I have managed to visit partially only companies oriented on skialpinism and freeride. First tips from ISPO are described here. There is not enough snow in our home mountains Beskydy, so we have started to look for the higher mountains, and especially with more snow. The choice fell on Italy, mainly due to the affordability of housing, snow hight and cheap wine. Foppolo skiing resort, which is above Bergamo, none of us know, but Google Earth promised good lines. There is nice article Prevent Damage to Boot — Improper Use of Tech Bindings with photo of significantly damaged shoe around holes for pins of Dynafit Tech binding at website www.wildsnow.com. Shoes with proper shoe sole is almost impossible to damage in such a way, but if you shoe sole is damaged, it can be very easy. There occured discussion about Avalanche Ball at Czech forum Outdoorforum. Avalanche Ball is suitable for faster obtaining first contact with the area of person buried by snow avalanche. Some people in this discussion suppose that Avalanche Ball is equipment of the same value and practical usage as ABS Avalanche Airbag System or Snow Pulse, it is convenient to look more in detaile, what Avalanche Ball is, what's its advantages, disadvantages and way of usage. I was looking for hard boots for skimountaneering, freeride and jumps last year. After some time of searching I have found Scarpa Spirit 4. I have no experience with other types of boots, so that following text is only my personal experience with Scarpa Spirit 4.